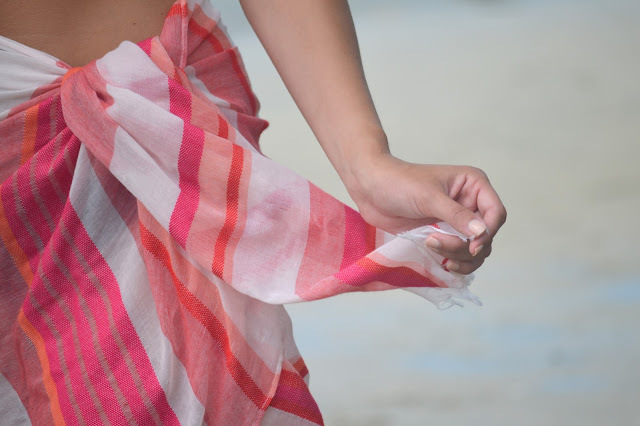 I love summertime scarves, and I especially love summer scarves that double as pareos. I had this scarf (a gift from a friend) in my bag for the weekend to potentially pair with a white tank and jean shorts, but when I threw on a bikini for Friday, I wanted a cover-up that also showed off this unique ruffle top. I had packed a variety of options but nothing I was loving for this swimsuit, and since the morning was overcast, I knew I wanted something to go over my swimsuit. Finally it clicked that I could double this cute scarf as a pareo, and it was perfect for lounging on the dock while waiting for the sun to appear - and it will be on repeat throughout the rest of the summer. Though this one was a gift, I'm sharing some favorite scarves and pareos that are perfect for summer.